300saum at 30 yards with 168grn LRAB.. I was lucky enough to be invited to go and do my thing last night on a large Wairarapa Station. Never been there before but it wasn't hard to find my way around and to latch onto a small mob of deer. I was stalking them when Tilly changed her demure and I guessed there was a pig around. I thought that the owners would rather I shot a dirt digger than a grass eater so I switched to pig hunting mode and cranked my 'scope down to 3 power. We spotted each other at the same time at 20 yards and I was lucky enough to get a shot into him as he bolted. Fat as butter. Sharp little hooks. Last edited by Tahr; 05-11-2017 at 06:10 PM. Shootm, nor-west, GWH and 10 others like this. Nice, a little bit of pork makes a nice change from venison. You’d be happy with that. 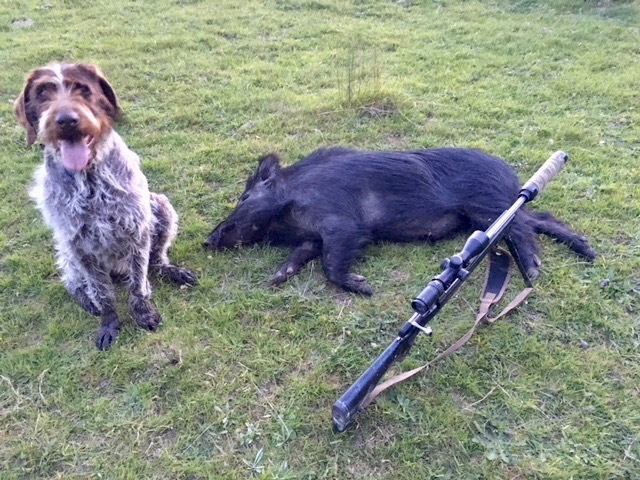 Should be a tasty addition to the freezer, nice to get a pig or two from time to time. Tahr, veitnamcam and GWH like this. well done, Tilly certainly looks chuffed in the bottom picture. Good going Bruce. Our wetherby has arrived. 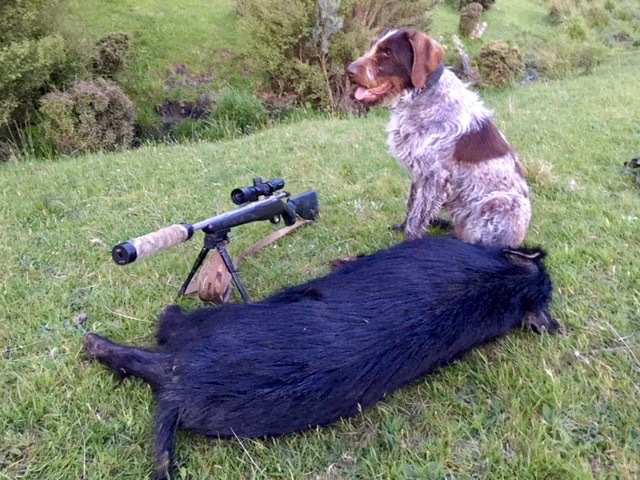 That was a great place where I shot the pig and I think that we are welcome back to try our new 257mag Cheers NW! @HUNTY Its really interesting that now she has sat next to 89 or so dead animals she is quite cooperative about posing. She's also becoming quite interested in back tracking the dead ones which I'm going to need to get her out of. Once she has found the shot animal she will disappear back-tracking it if I don't watch her, and I can miss where she actually found it. Maybe time for her to go on a tracking line again. Last edited by Tahr; 06-11-2017 at 02:54 PM. @Baoaraxa I haven't made pork bacon before but I make venison bacon so will have a go using the same recipe and smoking process. I will let you know how it turns out. @Shootm yeah I only get one every year or so so I always get a kick out of it. The cocky had shown me around the station in the morning and had said that fortunately there weren't many pigs because he hated them. So it was a stroke of luck that I struck one. He had come out of the Haurangi forest park on to the grass.